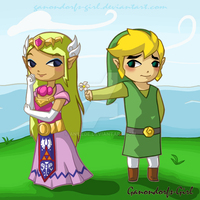 So I herd u liek link/zelda? I really like the way it looks like your style and yet still somewhat Wind Waker in terms of style! And their tiny little arms... so cute! XD I love the way you did the hair on them both, too! Awww ty so much Primmy ;///3///;!! Ah, thank you! Sorry about the late reply, I've been AWOL lately.>< World Cup, practicing and sleep doesn't leave much DA time.xD I'd love it if you submitted them because it'd surely be an awesome surprise! Mad I envy your art skills, gimmeeeeeeeeee. Aww, cute! I like their expressions. ROFL no way, yours has actual Link personality LOL mines just "ooh, that one looks easy to draw cute +0+"
FCK I THINK I BROKEMY KEYBOARD. Awww, it's too cute! I especially like how you drew Zelda's bangs! Minish Cap is just an adorable game.